The Little Crooked Cottage : Mr. Pig LIVE . . . with Skippyjon Jones!!! Mr. Pig LIVE . . . with Skippyjon Jones!!! You're never going to believe the guest I have on my show today. He's the super-famous Siamese cat . . . ahem, I mean Chihuhahua who has won the hearts of millions of readers. Clap-clap for the star of the #1 New York Times bestselling series . . . Yes, THE Skippyjon Jones! But before we interview him, let's take a peek at his latest book, SKIPPYJON JONES, SNOW WHAT. Roll the clip please. . . . Welcome, Skippyjon! Is that what I should call you? My full name is Skippyjon Jebediah Jones. But you can call me Julio. Then welcome, Julio! I'm your biggest ham, I mean . . fan! Sorry, I'm feeling a little starstruck. What one word best describes you? Yes, I have a fuzzy navel. No one believes that I am a Chihuahua. Naturally. What is your idea of the perfect day? Wow. You're really into Chihuahuas. If you could have any superpower, what would it be? Would you like to be a Chihuahua? I've never thought about it, but now that you mention it . . . yes! What are you reading right now? I’m not reading anything right now because I’m talking to you. That would be rude, Mr. Pig. 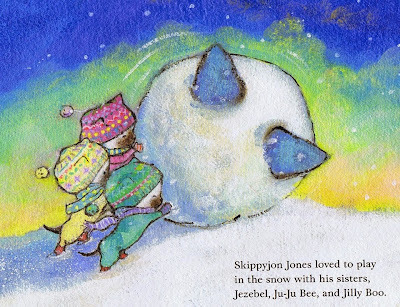 From Skippyjon Jones, Snow What. Copyright 2014 by Judith Schachner. That would be the time my mama kissed me on page 31 of the first SKIPPYJON JONES book. Do you know how many kids have seen that? Gross!!! Is that when she called you "Mr. Cocopugs"? . . . What? You don't want to talk about it? You mentioned this in your contract? Oops. Moving on. What is your pet peeve? That’s not his name – his name is Mr. Purrfect. I don’t know how to speak Spanish. . . .
Oh, you knew that already? How did you know that? The Chihuahuas from SLEEPING BEAUTY, LITTLE RED RIDING HOOD, and THE BIBLE. A cure for fur balls. HA! 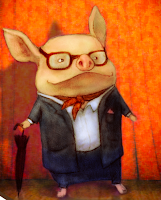 You are one funny pig! You know I don’t wear pants. I have worn tights on occasion but they don’t have pockets. Oh, right! What did you eat for breakfast this morning? What was it like working with Judy Schachner? It used to be boring until I started eating her artwork. Well, YOU are not boring, Skippyjon Jones! Mucho gracias for this scintillating interview. Please stay for a special Skippyjon Jones-themed lunch made especially for you by Nina at Mamabelly's Lunches with Love. Mirror mirror on the wall, who is the bravest Chihuahua of them all? Skippyjon Jones, the Siamese cat who thinks he’s a dog! 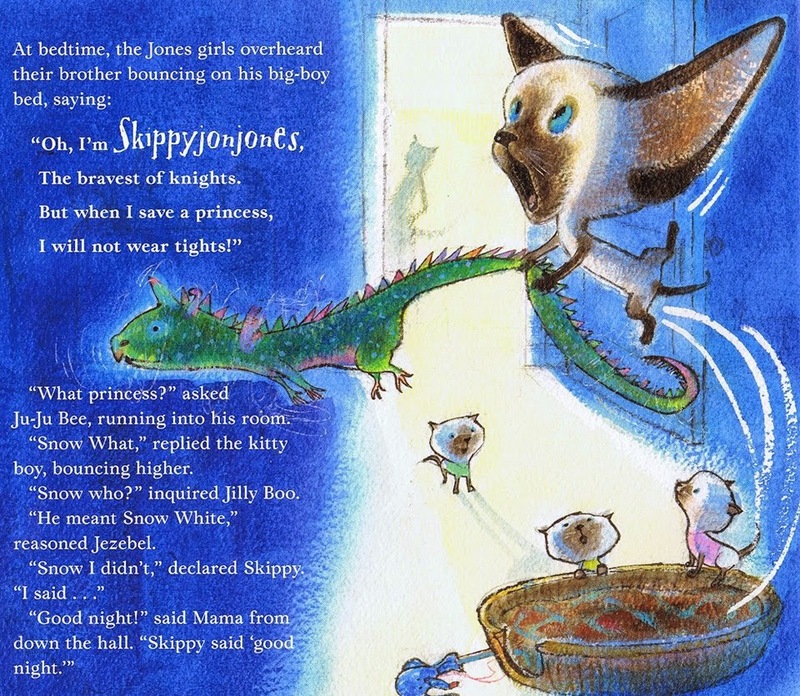 While his sisters listen to Snow White and the Seven Dwarves, Skippy bounces on his big-boy bed and heads off for the REAL adventure awaiting him in his closet. 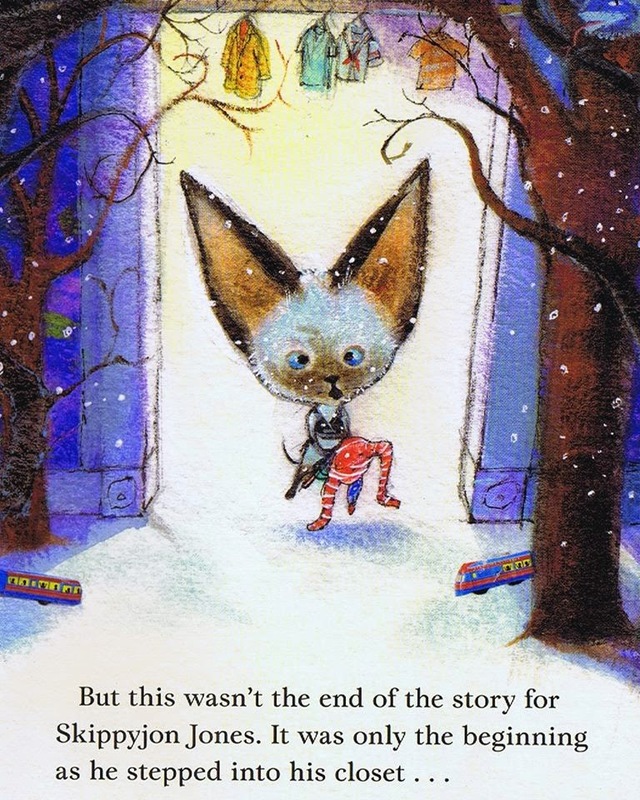 Once inside, he finds himself in a magical snowy forest of make-believe, where the seven Chimichangos challenge him with his most dangerous task yet: to wake up Nieve Que, the frozen princess, by kissing her! Yuck! Will this hero agree to don a prince’s pantelones and save his poochitos? 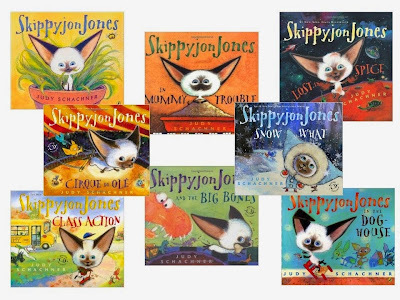 Read all of the Skippyjon Jones books! 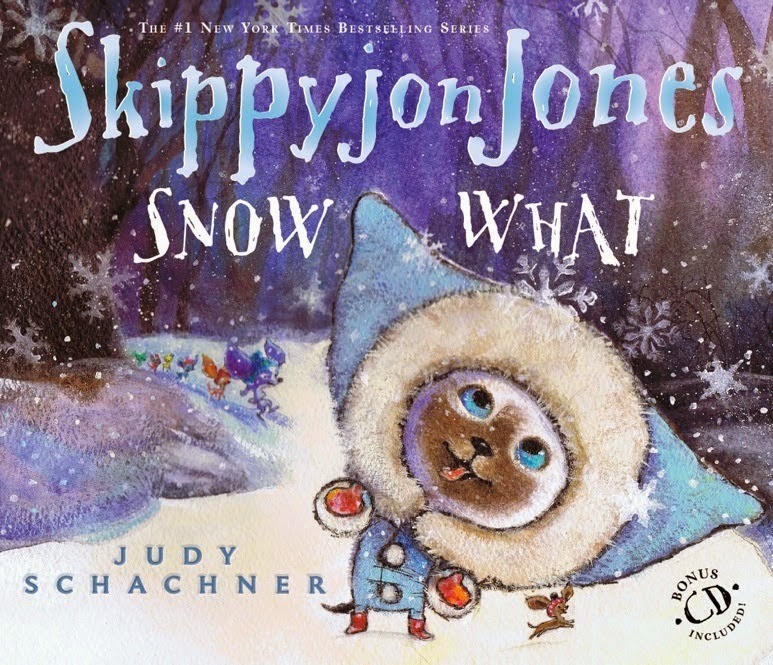 In addition to being the Mamalita behind Skippyjon, Judy Schachner is the author and illustrator of The Grannyman, Yo, Vikings!, and Willy and May. Judy Schachner lives in Swarthmore, Pennsylvania with her family, a dog, and two Siamese cats. Visit her website at www.judithbyronschachner.com. Jedediah? Who knew?!! You really are the cat (I mean dog) of our dreams, Skippyjon. 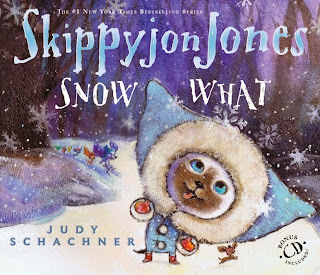 That Judy Schachner's pretty cool, too. Mr. Pig didn't know that either, Anika! That cat, erm, DOG is full of surprises! Thanks, Jess! Skippyjon Jones found Mr. Pig's books delicious, too. Ah well. That's the price of hosting a superstar.